The annual Fringe Festival has officially begun, which means overwhelming numbers of people and shows. Whether you’re a local or an out-of-towner, you’re going to have to contend with both at some point (unless you go on holiday for the entire month of August, which is, incidentally, when the rest of Europe goes on holiday). I’m now years into this craziness, and here are a few things I’ve learned. Pace Yourself. This is definitely number one. 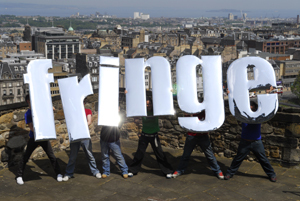 There are thousands of shows on, and the Fringe is only one festival happening in August (there are also the International Festival and the Book Festival). The Fringe catalogue of shows alone is half an inch thick. Unless you don’t need rest or sleep, if you try to see everything that sounds interesting to you, you’ll die of exhaustion. My suggestion: pick one festival (say, the Fringe) and focus on areas that are of particular interest to you (maybe comedy and theatre). Read the descriptions of those shows and pick some to go see. This is not to say you might not add to your list later — there are plenty of free shows happening, and flyers are being thrust at you from all sides as you walk down the Mile, so surely you’ll hear about something else you want to see — but at least this way you’re not spending weeks just trying to get through the show descriptions. Take Time to Enjoy the City. Edinburgh’s awesome. Yes, the Royal Mile’s cool, but there are lots and lots of other neat areas to discover that aren’t choked with people right now. Take a break from all the darkened theatres, stretch your legs, and explore the New Town (not just Prince’s Street) or Leith. Loathe as I am to encourage crowds of people to head to my neighborhood (what can I say? I like it quiet and I’m a little selfish), my neck of the woods, Stockbridge, is incredibly charming. Lots of little restaurants that won’t be too crowded, and cute boutique-y shops you won’t find anywhere else (which is not something you can say about George or Prince’s Street). Pop into one of the free museums — they’ve got some great exhibitions on now. Bring Good Walking Shoes. This city is very hilly and cobblestones are still a very popular paving material, particularly in the older sections (where almost all the Fringe activity is going on). Those heels that make your legs look great will inevitably get jammed in a crack in the street and you’ll either faceplant or find yourself desperately trying to tug free while a bus bears down on you. Wear flats. Don’t Complain About the Weather. Seriously, this is such a cliche anyway. We know it’s cooler than it is in the U.S., that’s why we have jumpers and jackets. We know it rains, that’s why we have cute wellies and brollys. You can find all of these things at any of the stores right on Prince’s Street, so go ahead and kit yourself up and get used to carrying an umbrella around at all times. Get a Sturdy Umbrella. Speaking of umbrellas: get a good one. Rain and wind go hand-in-hand here, and that cheapo you bought won’t last a second. Invest in a decent umbrella or you’ll regret it fast. Brace Yourself for Flyers. Getting around the Royal Mile or any of its side streets is like running a paper gauntlet. Hands appear from all sides, thrusting flyers at you and begging you to go see this or that show. You can do a few things here: focus straight ahead, refusing to make eye contact or acknowledging the flyer-givers; perfect an incredibly fierce stare that warns people not to approach; murmur a polite refusal; just take the flyers (though by the end of a 100-yard walk you may have more than you can carry). Whatever you do, remember that these are all artists trying to promote their shows or students working for minimum wage to promote a show, so don’t be a jerk to them no matter how annoyed you are by all the offers. Try the Haggis. Just once, to say you did. How about it, Fringegoers? Any other tips to add? I lived in Edinburgh for 10 years and while I did attend some Fringe shows over the years, I can’t say I enjoyed the month of August – for someone like me who didn’t take holidays during this time, it was horrendous is terms of going home from work. 1. Try the Scotsman pizza at Mamma’s (Grassmarket) – this is your best introduction to haggis and you don’t have to order a full pizza, Mamma’s can do half and half for you. 2. If the show you want to go to isn’t the sort that would sell out and you don’t want to pay the pesky booking fees and/or don’t trust the official website (because it has a tendency to crash although it might be better now) – go to the venue itself to purchase the tickets. I’ve done this several times. 3. Carlton Hill – best place to get away from it all and best place to see the fireworks during the concert that officially closes the festival. Bring a portable radio so you can listen to the music.